An isolated existence in a cage deprives cats of the opportunity to engage in the most natural feline behaviors – behaviors that are essential to help them cope with the stress inherent in shelter living. Resting, stretching and hiding (and low-level perching) may be possible if the cage is sufficiently large and enriched. However, running, jumping, climbing and perching aloft are impossible – or severely restricted – even in the more spacious cages and condos recommended today. In addition to the availability of choices, a group room affords cats a sense of control over their environment, thus eliminating a major source of stress for sheltered cats. Soft, washable bedding should be provided for each cat. Try to allow for at least one more bed, box or comfortable napping spot than you have cats. A litter box for each cat is ideal, but at least one for every two cats or three kittens is workable. Litter boxes should be strategically placed so no cat can prevent the others from using one, meaning they should be scattered throughout the room instead of collected in one central place. Be sure to monitor carefully to ensure that every cat is using litter boxes regularly. Litter box locations are important, since cats feel particularly vulnerable while using them. Some cats find security in privacy, so place some boxes out of view of most of the room. Place litter boxes to allow an escape route so cats are not cornered or trapped. Generally this will work better than covered boxes, which are not recommended in a group setting. Food and water should be separated from litter boxes by a physical barrier or a space of three feet. A set of food and water bowls for each cat is preferred. A set for every two or three cats can suffice, but be especially alert to guarding behavior and ensure that every cat is getting sufficient food and water. Spread food/water stations throughout the room to maximize access. All furnishings (bedding, litter boxes, food and water, hiding places, perches, toys and other enrichment items) should be sufficient in number and placement so every cat has access. 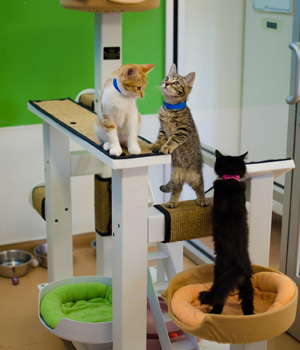 Group housing works because it allows cats to engage in their natural behaviors – hiding, running, climbing, jumping, elevated perching and scratching. Structures of some sort are essential to these activities and to the success of the group room. Available types include prefabricated, custom-made, homemade and makeshift (plastic chairs or cubes, cardboard boxes). They can be affixed, built-in or mobile. Hiding places should be easily available and numerous, since hiding is perhaps the most important way that cats avoid or cope with stress. Perches and resting places – some with hiding opportunities – should outnumber the cats in the room. Remember, each cat needs control over his or her environment by having a choice of options. Hiding and perches/resting places should be spread throughout the room so cats need not cross the path of other cats to get to one. Jumping and climbing opportunities – such as catwalks, ramps and steps – should be easily available. Non-porous material that can be disinfected should be used for any structure that is built-in or otherwise immobile (due to weight or size, for example). In the event of illness in the room, all contents that cannot be disinfected must be removed and discarded. Removal of contents that cannot be sanitized is advisable whenever disinfecting is necessary – such as before a new group of cats is housed in a room. Failure to do so increases the risk of illness. Vertical space should be maximized through the use of elevated structures. That increases the space each cat has to establish a personal territory/buffer zone, each cat’s ability to engage in natural behavior and control his or her own environment. A combination of built-in structures fixed to the walls and movable structures in the center of the space provides the most effective use of the vertical space. Complex structures that provide many options offer greater stimulation for cats. Structures that are not built-in or anchored must be sufficiently stable (by virtue of mass or design) so there is no risk of rocking or toppling under the weight of the cats. Although high perches are desirable, they should not be so high that staffers are unable to reach the cats when necessary. Scratching is also an important natural behavior and ample scratching opportunities, both vertical and horizontal, should be available. Though other materials are acceptable, natural sisal is preferred. Sisal is the only material that promotes shedding of the outer sheaf of a cat’s claws, as bark does in nature. Bark is not generally suitable for group rooms due to the likely presence of parasites. In evaluating materials other than sisal, avoid those containing dyes or other chemicals which might harm a cat if ingested. Consider the ability to clean and disinfect the scratching post before purchase. For most rooms a large post of natural materials will be a wasted investment as it will need to be discarded within a relatively short time frame. Smaller options, such as corrugated cardboard scratchers, can be excellent, inexpensive additions to a group housing area, and can be placed horizontally or mounted vertically with plastic cables. Vertical scratching surfaces should be high enough for a cat to stretch out completely while using them and must be stable enough not to rock or tip over when in use. If carpet is used, turn it over. The underside of carpeting provides a much more effective scratching surface than the fibers. Carpet cannot be disinfected and should be considered disposable. Consider whether the material used might habituate the cats to scratching that is undesirable to adopters. For example, donated furniture, perhaps desirable as a perching or resting place, may be a bad idea if its wood or upholstery is used for scratching. A cat has no ability to distinguish between the donated piece of old furniture at the shelter and the Queen Anne chair or Chippendale desk in an adoptive home. Changes to a cat’s environment are significant sources of stress, and introducing a cat into a shelter constitutes a drastic and traumatic change that can produce enormous stress. It’s important to reintroduce consistency and regularity into the cat’s everyday life and routine as soon and as fully as possible. Regular schedules should be established and followed strictly. This includes feeding time, play sessions, cleaning, and other routinely performed tasks involving group housing. Each task should be performed at the same time each day. According to one study, housed cats organized their daily activity patterns around human caretaker activity. To the extent possible, each task should be performed not only at the same time each day, but also by the same personnel. This approach affords the cat a familiar face and consistency in the manner the task is performed. One study found that cats receiving consistent, positive, and affectionate handling by the same people over a three-week period were significantly more likely to be adopted than those handled inconsistently by various people. An added benefit of using familiar caretakers for tasks is that they become more attuned to the personalities and behaviors of the cats in their charge, and hence are better able to discern a cat’s individual likes and dislikes, detect health problems, and to be aware of incompatibilities among the cats. Lights should be turned on and off on a regular schedule, both to provide predictability and to facilitate a natural sleep cycle. A timer can be used to simplify this protocol. Each cat should have the opportunity to receive individual attention without interference or involvement of other cats. Sometimes this means using a socialization room that is separate from the group room. Remember that cats are very much like people; they may have a preference for one activity one day, and another the next. Play-based interaction should be designed to provide daily exercise and to allow the cat to engage in pseudo-predatory behavior. Toys, such as feathers attached to a rod, that provide an opportunity to chase, pounce, and “capture” are generally favored by cats and provide the greatest therapeutic value. Toys should be changed from day to day to avoid habituation and loss of interest, which can occur quickly in cats. Avoid toys with small or ingestible parts; toys with strings or other materials that a cat might ingest should be removed after play. Non-hazardous toys can be left in the room for cats to play with on their own. Toys that provide movement are considered best. Balls are excellent for this purpose, as they can be propelled by the cat and offer the pseudo-predatory opportunities noted earlier. Puzzle feeders and toys or contraptions from which cats must manipulate enclosed food provide excellent stimulation and mimic some aspects of predatory behavior, primarily the hunt and the capture. A variety of such puzzles can be found at most pet supply stores, but can also easily be made from cardboard tubes, egg cartons, or anything else that will hold food that cannot be dislodged or acquired without some effort on the cat’s part. As with all forms of enrichment, ensure that there are a sufficient number of toys or puzzle feeders for all cats to have access to one or more during the course of the day. There is little conclusive evidence regarding the effectiveness of sensory enrichment, so these methods should be used to supplement, rather than replace, other methods. There is ample anecdotal evidence that cats are drawn to windows that provide views of human or animal activity. In contrast, there is scant evidence suggesting that a television screen holds the same attraction to cats in general. Nevertheless, some shelters use television screens to provide some visual stimulation to cats. If you choose to try visual enrichment via televisions or other media, be aware that the shelter is already a very stimulating environment and adding some types of visual stimulation may do more harm than good. Experiment carefully and monitor the results to see how the cats are responding. Many sounds are known to cause stress in cats. Less is known about what sounds may be pleasant for cats. Some shelters play soft music in group rooms or throughout the facility. There is not much evidence that music improves the welfare of its listeners, but playing soft music has not been proven to cause harm. Music might also serve to mask stressful sounds in the shelter. Be mindful, though, that cats can hear frequencies we cannot hear. Some sounds might be disturbing or painful to them even though they seem pleasant to us. Just as it is critical that cats experience periods of dark to maintain normal circadian rhythms, they must also have periods of quiet, so do not leave music playing 24 hours a day. Also, be mindful that noise made by caretakers and visitors may be jarring to cats, so make a conscious effect to keep noise down. Putting aside pheromones, catnip is the only scent to which cats are proven to react favorably. Catnip can promote play and activity, but has not been empirically shown to facilitate adaption to new environments, as is sometimes claimed. Because catnip can make cats aggressive and unpredictable, it should be used under close supervision. Its utility is somewhat limited by the fact that susceptibility to catnip is a genetic trait and roughly one third of the species is immune to its allure. Lavender leads the list of other scents claimed to confer a benefit, along with valerian and honeysuckle. Scientific evidence is lacking, but use of these other scents cannot hurt and may help. As with other sensory enhancements, it is reasonable to experiment with scents as an enhancement and make your own judgment. A final note: Be mindful of the effects that residual cigarette smoke, perfumes, or other scented personal products may have on cats. 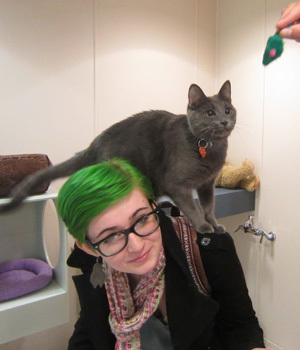 Recall the last time you were in an elevator with a liberally scented individual and spare the cats that trauma. The jury is still out on pheromones, but there is no evidence that their use is harmful. The studies supporting the use of artificial pheromones to promote adaption to new environments or ease transition into a group are largely confined to those sponsored by manufacturers of products. Independent studies following acceptable protocols have neither proved nor disproved claims of effectiveness. Pheromones have staunch advocates among animal health experts, particularly in the United Kingdom and Canada. There is also a large body of anecdotal evidence of the effectiveness of artificial pheromones for treating behavior problems and soothing owned cats. Discussions regarding subtle environmental sensory enrichment strategies for shelter cats are continually evolving, and some will no doubt be scientifically confirmed. However, they are not a substitute for providing sheltered cats control over their environment by creating multiple opportunities to engage in any of the full range of natural species behaviors.